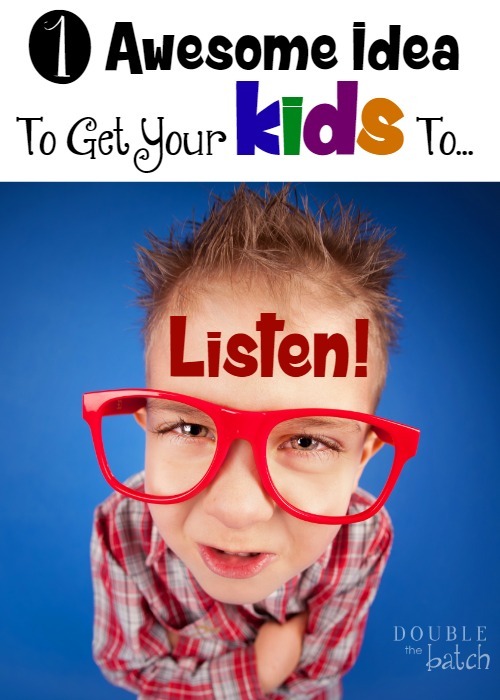 Tired of being ignored and wondering how to get your kids to listen and obey you again? Maybe give this a try. A few years ago, when my oldest three daughters were 8, 5, and 3, they started having trouble with their hearing. It had been an ongoing problem that progressively got worse until my children’s ears seemed incapable of hearing the sound of my voice. It was selective, however. If I mentioned anything about cleaning up the house, it fell on deaf ears. But, if I mentioned a fun outing or the word ice cream, miraculously their hearing returned! Requests to get ready for school– deaf again. Family movie night- Perfect hearing. This made me suspicious that they just might be ignoring me– their mother– the one who through arduous pain and sacrifice gave them life. Can you imagine? I’m sure I’m the only mother who has experienced this. I tested my theory and confirmed that, in fact, there was no actual hearing loss involved. They were just being little turkeys and choosing not to listen to their mother hen– and my feathers were ruffled. I was done with it. I was done with being the only one who cared if the house was clean. I was done nagging and nagging to get them to do anything to help out. I was done begging them to get up and get ready in the morning. Done. Done and done. I looked up the word “Mother” in the dictionary, and it didn’t say anything about a crazy woman who everyone in the household knows is their personal slave, but who wanders around giving orders anyway. Nonetheless, that is exactly how I felt. Now, I believe in natural consequences, so I thought about the situation and decided if my requests were going to fall on deaf ears, then their requests were going to fall on deaf ears. I devised a plan to carry out this natural consequence and sat them down to calmly tell them how it was. The consequence commenced. There was weeping, and wailing, and gnashing of teeth. I was the declared the meanest mom in the world! Didn’t I even care about them??!! I kind of wished I actually had some temporary hearing loss to block them out. It was so tempting to say something to try to quiet them down, but I stuck to my guns… or my computer, which we all know is how moms play when they are home bound, and incidentally a great conduit for helping you ignore your kids- which I, of course, do not recommend under normal circumstances. But, these were not normal circumstances! Walking around your house all day and being treated as if you are an annoying ghost by your co-inhabitants is enough to drive a lady mad! It was time for a serious change around these parts and I was determined to make it happen. Anyway, the first day they pummeled me with requests, testing my resolve to truly ignore them. They even tried to trick me into responding, but I was resolute. I held firm. And I cringed inside as the house became a disaster that I could not attend to. I made meals for myself and my husband (we are really the only ones who eat the delicious meals I make anyway. Why will kids eat boogers and dog food, but refuse to eat really dang stinking good meals made by their mother with love? I will never understand it.) My kids ate cereal and bagels they made themselves. They kinda picked up the house… kinda. By day two, they knew I was serious. The anger died down as reality set in and they shifted their focus to making the problem go away as fast as possible. They made a real effort to clean up the house. By bedtime, it was not up to my standards, but for kids working on their own, they did alright. I kept my expectations reasonable– it was the effort they put forth that I was really looking for. They were nagging each other to clean up instead of me nagging them, which was wonderfully awesome and annoying all at once. I continued my heavy web-surfing schedule and observed their behavior in a very non-intrusive manner. On day three, resigned to the task before them, they took care of business and did what they had to do to get this thing over with already. On day 4, I decided to let them off for good behavior on the less than clean house the first day and end the consequence without adding an extra day… because I can be a sweetheart like that when I wanna be. 😉 My ears opened to their requests once again. Their was much rejoicing and hugs all around. We talked about the experience and how yucky it feels to be ignored. We talked about what a blessing it is to be a family and to have a house to live in full of wonderful things like food and toys and clothes. We talked about how God put us in families to teach us how to work together and to help each other and how He wants us to serve others so we don’t become selfish and lazy. I set my laptop and aside and started cooking meals they hate again. Order, was restored. The desired effect was achieved. Since that time, if they start to ignore me again, I say, “Do you really want to ignore me?” Generally, that is enough to get them listening again, but I have repeated the process a couple of times when they seemed to forget the lesson learned. If you enjoyed this post, check out this post by Trish or this post by Katie for more parenting ideas.